It is no secret that the three of us have thick, luscious locks all thanks to Mommy Vaid. Over the years we have loved, hated, and labored over our hair and today we want to share all our favorite products with you. Between the three (four including Momma) of us we have the entire spectrum of hair types. 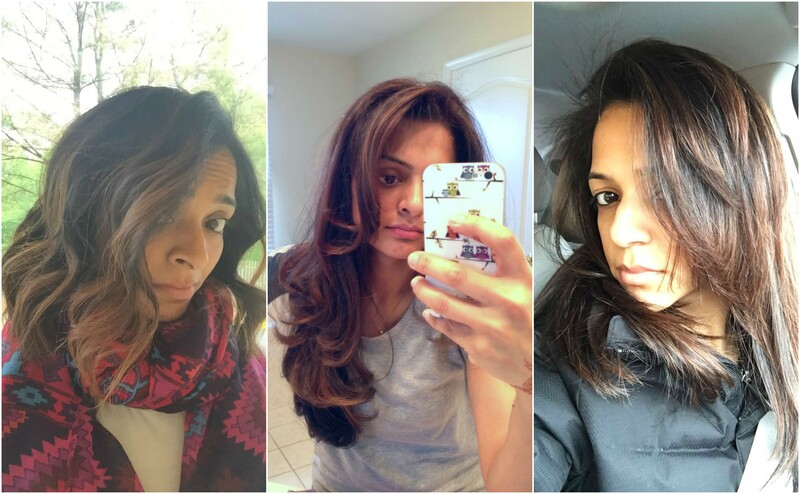 Mommy Vaid has ringlet curls – would you have ever guessed it? Then comes Sheena who has extremely curly and frizzy hair, so it is no surprise that her hair requires the most maintenance. Nina follows with loose curls. Her hair is a little more manageable but because of the frizz, she has yet to be able to wear the curls in that “beach wave” sorta way. Dipti comes in last with loose waves, if any. Her hair is the easiest to maintain as she is able to blow dry it with just a paddle brush!!! If only we all could manage that!!!! Read on for all three of our favorite products and links of where you too can buy them ALL!!! Once upon a time, back in her teenage years, there was a time Sheena didn’t use anything in her hair and just walked out with it washed and let it air dry. However, in college, Nina taught us how to “blowdry” our hair with a real brush and how to keep it smooth and frizz free. That changed her life and she has never been able to let her hair “air dry” again! With the change of hair texture after her pregnancies and her color needs (yes, there are ton of white hairs that just showed up in recent years, which has its own needs), her products changed and she is set on this list to the T for now. She loves the powerful Twin Turbo hairdryer, it blows out really strong hot air which cuts her hair drying time to almost half! As for the shampoo/conditioner, her friend introduced her to Pureology for dry and color treated hair and she is obsessed. It smells divine and leaves her hair soft and luscious. Sheena has tried every ceramic brush under the sun but just can’t come to grips with it. When blow drying her hair, she feels like the ceramic brushes, 1. dries her hair frizzy and 2. curls it too much at the ends. Since she likes to blow dry her hair pin straight she prefers a wooden round brush with boar bristles. That has the best grip and dries her hair the best in her opinion. Her hair stylist introduced her to Oribe Cream Shine to put in her hair before she blows it out and it is absolutely amazing. It smells out of this world and keeps the frizz at bay. It is a definite must have. The Remington curling wand (Target) and the Hot Tools curling iron are so clutch. The ascending barrel width on the wand gives the hair a nice ascending curl which keeps the hair tame in the top parts of your head. The wand is perfect for when you want subtle curls with spiky tips, like beachy waves. For more of a tight curl and curled ends, the curling iron is perfect. 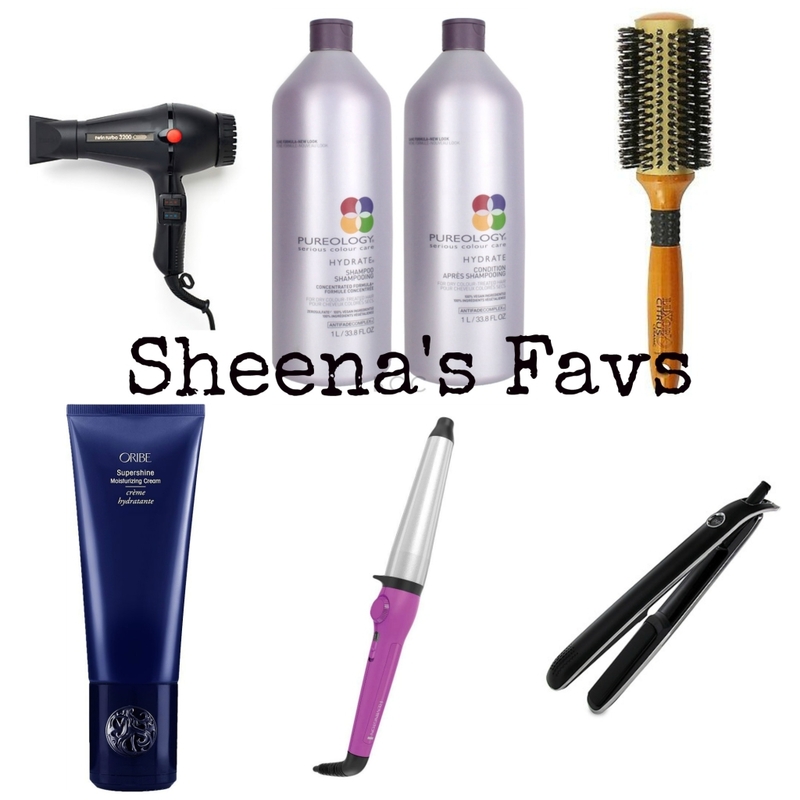 Sheena prefers the wand when her hair is on the shorter side and the curling iron when her hair is on the longer side! 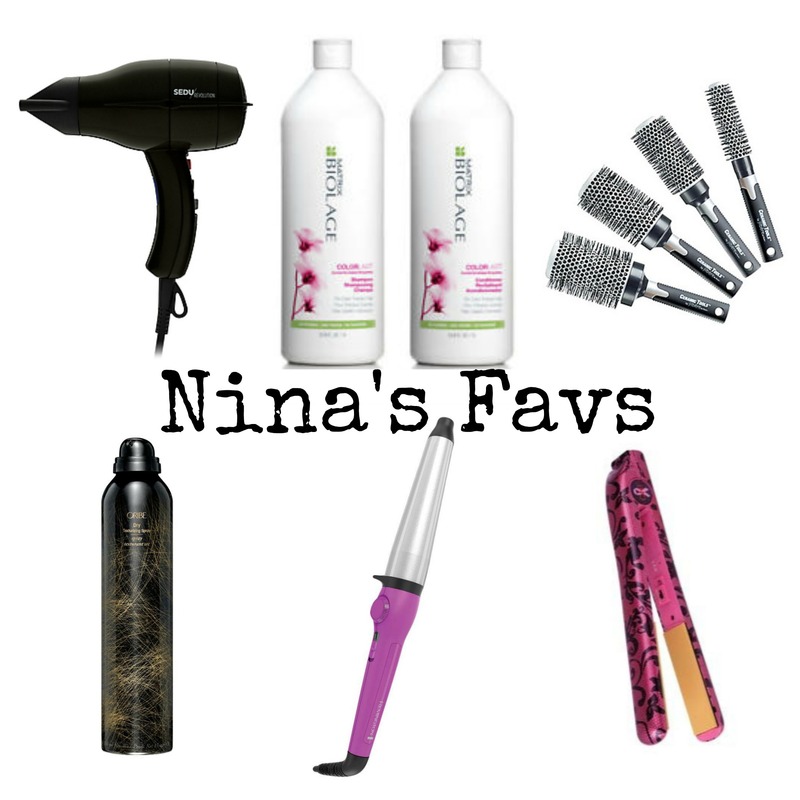 For the longest time, Nina did the same old same old in terms of hair care and products. However, it finally happened where Nina’s long time love – her basic Conair Hair Dryer – took its last wind and off it went into the recycling heavens. That was when she turned to her cousin Sonya S. who has the most amazing hair on the planet. She recommended the Sedu hair dryer to her and now Nina has found a new love. She had purchased it in pink and loves the small compact nature of it along with the strong heat it provides to quickly dry her hair. In terms of shampoo and conditioner, she recently switched to the Matrix Biolage for color treated hair and loves it. It keeps her color in longer and smells amazing – it is also paraban and sulfate free – which is the current fad for hair care! For her hairbrush she loves her ceramic round brush as it seems to dry her hair very quickly without taking all the volume out. She can get pretty good curls at the ends of her hair as well with this brush since it dries quick and stays hot – which is a big point she differs from the other two as they like their hair blown out pin straight. Her favorite hair product is the Oribe Dry Texturizing Spray. She uses this on her bangs and roots of the top of her hair after blow dryer to add in some volume and lift. It can become stiff if you use too much, but used sparingly it’s great! The curling wand is the same that Sheena recommended we all get. Nina has yet to use it still but definitely has it ready to go when she doesn’t have time to do it with the ceramic brush. Lastly, her favorite flat iron is her Chi Flat Iron which she found for a steal at TJ Maxx. Although she rarely uses her flat iron because it makes her hair greasy within hours, she will reach for it when she needs a touch up on those rainy/humid days. Back in the day, before hair irons, Dipti used to spend a lot of time using a big round brush to dry her hair so that it set well. She used to love how Nina did it and tried to maintain it the same way. Well, that all ended real quick as her need for sleep kicked in and her morning routine cut down from an hour to 20 minutes. Now it’s all about efficiency and using her time and money wisely (more on that here). 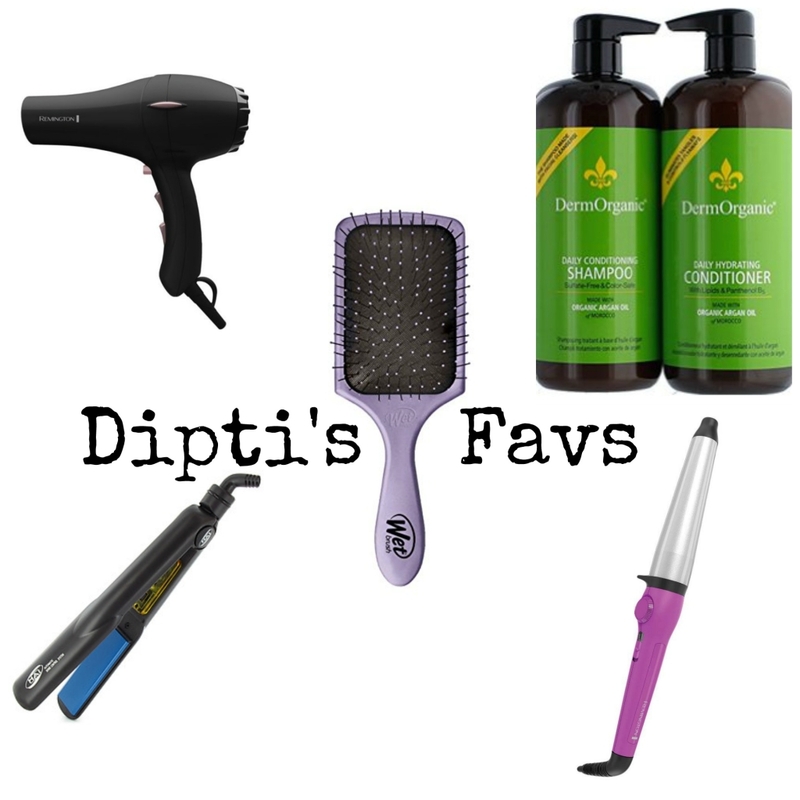 Dipti loves this Remington hair dryer because it’s powerful while still giving her hair volume. She always uses a flat brush to dry her hair as she don’t have crazy curls to tame. If she doesn’t have anywhere to be she’ll stop there. Otherwise, she goes the extra step and runs this Solia flat iron through it very lightly (not from the root as that makes her hair oily). On days she feels the need to get decked out, she uses the flat iron to curl her hair also! Sometimes she uses this Remington wand to curl but it takes her so long that she usually abandons it and goes back to her flat iron. Her shampoo/conditioner change frequently as that was what she was told is good to do. Right now she is using this DermOrganic shampoo and conditioner that she loves. She usually don’t leave any product in her hair after drying it because it makes her hair feel heavy and it gets oily quickly.